(CNN) -- African striker Emmanuel Adebayor has become the latest big-money acquisition by English Premier League club Manchester City. Emmanuel Adebayor spent three and a half years at Arsenal after joining from French club Monaco. The Togo international has joined from Arsenal on a five-year contract for an undisclosed fee, widely reported to be worth $41 million. The 25-year-old passed his medical on Saturday night at the club's Eastlands ground, where he was later welcomed by hundreds of fans. Adebayor's signing follows the $40 million arrival of Argentina forward Carlos Tevez, the $30 million deal for Blackburn's Paraguay striker Roque Santa Cruz and the $20 million paid out to Aston Villa for England midfielder Gareth Barry. "It made me feel really welcome and special and I can't wait to play for City's fans and show them what I can do," said Adebayor, who will wear the number 25 shirt that he also had at Arsenal. "I was born to play football and that is what I want to do. I have come here to make history for this club and those supporters. It is what the chairman and the manager told me that they want too and I can't wait to get started." Manager Mark Hughes was delighted to sign the former Monaco player, whose agent tried to stoke a bidding war by offering him to City's local rivals Manchester United. 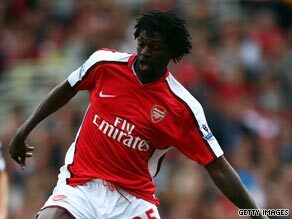 Adebayor had also raised the ire of Arsenal fans, who last season accused him of trying to broker a move to Italy's AC Milan following his 30-goal exploits in the 2007-08 campaign. "Emmanuel has been one of the top forwards in the Premier League since he arrived from France, and we are delighted he has agreed to come and join us," Hughes told club's official Web site. "Along with the other signings we have made in the last two windows, he will greatly enhance our ability to compete with the top sides. His arrival is another clear indication that we are determined to augment the players we have here with the best of international talent. "He adds vital balance and power to our attack. He has everything a top forward needs - he is versatile, powerful, quick and agile on the ball. I am looking forward to working with him, as are the rest of the staff. He will definitely add a new dimension to our play. I have been a great admirer for a long time." Hughes, whose club gave up in their high-profile attempt to sign Barcelona striker Samuel Eto'o - now likely to join Inter Milan in a swap deal with Zlatan Ibrahimovic - has a glut of forwards in his bloated, 57-strong squad. Tevez and Adebayor will be vying for a place with Santa Cruz, January's $23 million acquisition Craig Bellamy and Brazil star Robinho -- who arrived a year ago in a British-record $58 million coup. Felipe Caicedo, Valeri Bojinov, Benjani Mwaruwari and Ched Evans have also been given shirt numbers ahead of the new season. Hughes has released former England international striker Darius Vassell, while England Under-20 forward Daniel Sturridge has joined Chelsea for a fee to be resolved by a tribunal. Adebayor will now join his new teammates in South Africa, where their pre-season tour began with a disappointing 2-0 defeat against Orlando Pirates earlier on Saturday. Hughes is still interested in signing England defender John Terry, despite Chelsea saying their captain is not for sale, while Everton have rejected City's bid for center-back Joleon Lescott. "That's Chelsea's stance and we understand that," Hughes told Sky Sports News. "We're obviously looking to strengthen in the defensive area. It's a case of seeing what level we want to go up to. "We want to make sure we strengthen in the defensive areas. If there comes a point where we feel we can't advance any deal we're involved in then we walk away."